Photo courtesy of Gene Lowinger. Click for full version. 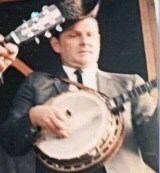 As a Blue Grass Boy: Ralph Stanley only filled in briefly as a Blue Grass Boy in August of 1951, after Rudy Lyle entered the military. Bill Monroe offered him a full time job, but he declined, not wanting to travel so much. Before and After: Ralph Stanley, together with his brother Carter, formed the Stanley Brothers and first recorded together in 1947. Following Carter's death in 1966, Stanley reformed the Clinch Mountain Boys and has toured and recorded with them ever since. Further Reading: John Wright's Traveling the High Way Home profiles Ralph Stanley, with extensive interviews of many former Clinch Mountain Boys.